The schools in the East Cooper Constituent District begin band in sixth grade. Wando High School has three middle level feeder schools: Cario Middle School , Laing Middle School, and Moultrie Middle School. Students receive a comprehensive instrumental education, as evidenced by their membership in the South Carolina All-State and Region Bands. All groups meet five times per week and all beginners meet in heterogeneous groupings. Seventh and eighth grade students participate in the South Carolina Band Directors Association Concert Festival, Solo and Ensemble, and honor ensembles. 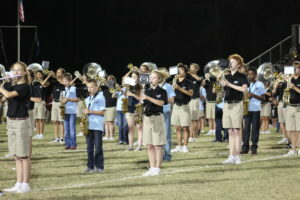 A large portion of the Charleston All-County Band is comprised of middle school students from the East Cooper area. Each of the middle schools annually participates in a Symphonic Camp setting lead by nationally recognized clinicians. Several of the Wando High School students provide private instruction to students in our middle schools through the Music Mentors program. Wando hosts all 8th graders at one football game in the fall to get them excited about marching for Wando (picture above). Wando also does socials with middle school campers during band camp in the summer.